LOCATION: Tsuru Bankside (they also have Bishopsgate and Mansion House branches, see website for locations). BREAD: Sliced white, nothing fancy. That’s the point. 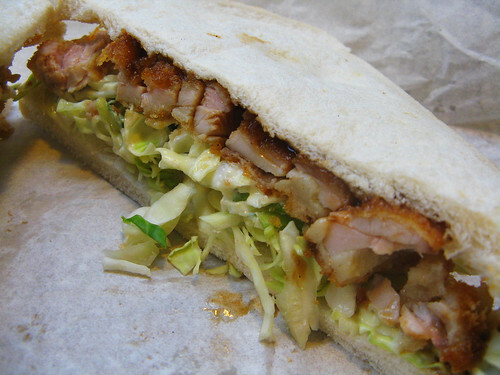 FILLING: Breaded, deep-fried chicken thigh with tonkatsu sauce, mayo and shredded cabbage. PROS: This is deep-fried meat in a sandwich so obviously it’s brilliant. The panko crust makes for a really crunchy coating on the strips of juicy chicken thigh meat (breast is also available but I went for thigh as it has more flavour). The chicken is drizzled with sweet, fruity and mildly spiced tonkatsu sauce, which I’m 98% certain I could drink a bucket of. Crunch comes in the form of shredded cabbage, which has the structural balls to stand up to fried chicken. The slick of mayo takes it beyond the deep-fried city walls and further into the nerve centre of ‘filthy-good’ and the sliced white is exactly the right choice of bread; perfectly bland and ready to receive. CONS: My most recent sandwich was a bit short on chicken and I would have liked an extra slick of sauce. Minor grumbles.